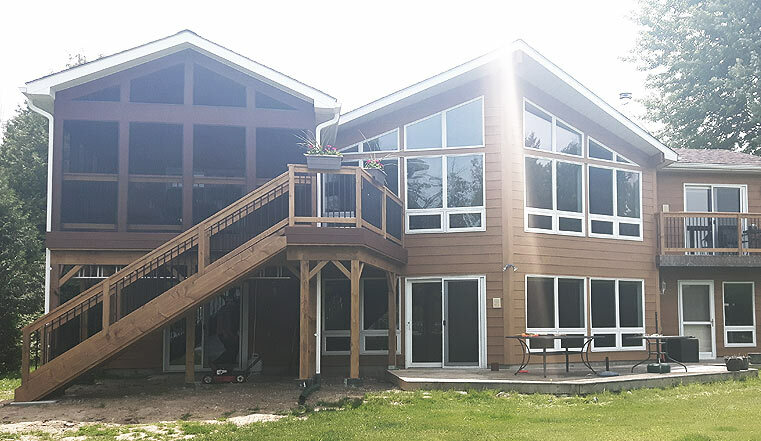 Custom Home & Cottage Additions | Conlin Premier Construction Inc.
Trust the experience and reliability of Conlin Premier Construction for your Peterborough addition project. Whether you’re looking to add a new kitchen, living room, dormer addition, family room, walk in closet (you name it!) we’ll ensure that your new addition ties into your existing home both aesthetically and structurally. With the professional help from our skilled and experienced contractors, you’ll be able to enjoy your new living space in no time at all. We believe that one of the most important aspects of a new home addition or garage conversion project is communication and customer service. Because each of our clients are unique and have different tastes and needs, it’s our goal to provide personal solutions to match each client’s individual situation. After all, we’re trying to help you build your dream home so we’ll work with you throughout the entire process to ensure we meet your needs and expectations. There are many additional factors to take into consideration when planning a new addition. Will your foundations require additional reinforcement? Will you need more piers to support the extra added weight? How about your existing electrical and plumbing? Is your air conditioning and heating system going to be able to support the extra load? These are the types of things we’ll assess and make you aware of as we begin your project. We’ll work with you the entire way from our initial consultation, assessment, planning & application process through to the actual construction and finishing of your addition. Contact us today to discuss your next Peterborough home addition project!